Cetaphil's Gentle Skin Cleanser has been my best friend since I was 15 and that was when I was breaking out everywhere! I was applying strong medication on my zits so cleansers formulated for troubled skin were too much for my skin to take. My skin became very dry. When your skin's stripped off its natural oils, it will produce more to compensate for the extra loss. They made me break out more! I think that we need to strike a balance in everything we do and this applies to skincare as well. Since I was using strong medication, I wanted a gentle cleanser. 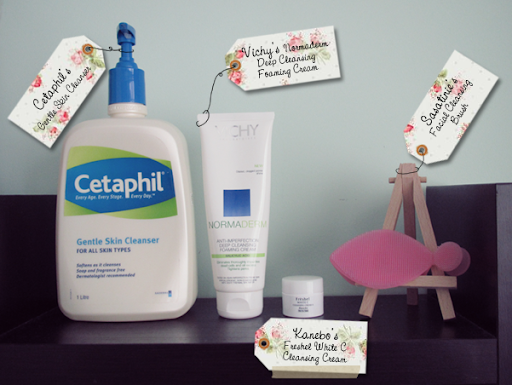 I came across Cetaphil and it has since taken up permanent residence in my loo! It is fragrance-free, non-comedogenic and will not strip the skin of its natural protective oils or emollients, or disturb the skin's natural pH balance. Vichy's Normaderm Deep Cleansing Foam Cream was given to me at the Vichy's Normaderm Workshop. I have been using this on and off in the mornings. This contains salicylic acid. Over-the-counter products for zits usually contain either benzoyl peroxide or salicylic acid. I find that benzoyl peroxide products dry out my skin like the Sahara Desert whereas, salicylic ones are friendlier. This product doesn't dry out my skin at all because it's cream (The gel one does.). Kanebo's Freshel White C Cleansing Cream is something which I have just started using. This is pretty moisturizing, so it's remaining in my loo. I can't say much about its whitening effect since I have just started. Sasatinnie's Facial Cleansing Brush was bought from Sasa for $8.90. I got this after Mich waxed lyrical about it. It was mentioned in one of Bubzbeauty's videos. I'm liking it quite a bit so far. The bristles are soft and they leave my skin feeling baby smooth! Lancôme's Visionnaire is hitting our shores soon and I was given a sample of it at its launch party. Even though I have been keeping late nights (Not because I want to! I just can't sleep! ), this has kept my face from going all red and blotchy in the morning! 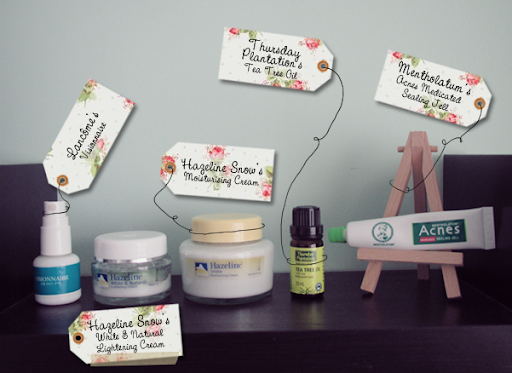 Hazeline Snow's White & Natural Lightening Cream and Moisturising Cream are my grandma's and grandaunts' secret to smooth, poreless (Swear! Poreless!) skin. I started on the former not too long ago as I want to be as fair as snow (Haha!). I alternate between them. For the former, I pile it onto my face so basically I go to bed looking like I have got a gazillion snow peaks on my face. These 'peaks' dry up and flake off in the morning. It can get a little messy, but I find that it keeps the oilies at bay this way. Thursday Plantation's Tea Tree Oil was purchased last month from Watsons. I use this for my back and it has been doing a pretty fine job in getting rid of the zits. I haven't got any now! //EDIT A reader asked how I use the oil. I apply 3-4 drops (Though the bottle says to use 1-2 drops.) twice every night, once after showering and another right before bed. I use more drops than necessary because the skin on the back is tougher than that on the face so it's alright for me. You may want to start out with 1-2 drops first and see how it goes. Mentholatum's Acnes Medicated Sealing Jell is dabbed on imminent and current spots. I wrote a more detailed review here after receiving it from The Sample Store and trying it out for a while.